It’s not often I get to go to the beach, and even less often that I see a seaside plant that I could even come close to calling a weed. Of course I am aware that this seaweed is not a weed in the conventional sense. But by golly, just look at its name. It is called seaweed! So how can I resist? When you spend time gazing at the waves, it’s easy to imagine that the ocean is teaching the lesson that we should grab every opportunity that comes our way. Whatever the tide brings in or the swells reveal are gifts offered up for the taking. So given this view, I welcome the opportunity to delight in the rhythm of the waves and the peek-a-boo game the ocean plays with these tangled strands of trapped seaweed. 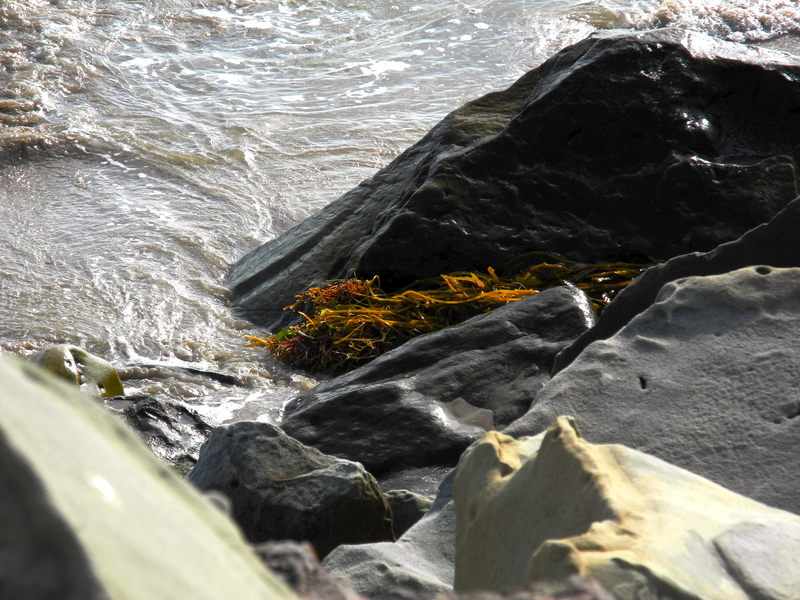 The seaweed is unable to escape its entanglement amongst the rocks, and the waves repeat their advance. They simply poke and needle and entice the seaweed with teases of movement, or escape and the possibility of freely floating out into the open waters. Today I learn to go with the flow. The waves soothe me and replace my hectic inner dialogue with the therapeutic in and out regular breathing of the waves. The waters swirl and hide the seaweed, caress the rocks and sculpt the sand all with the ease of a centuries old dance.